I don't know the general etiquette on this, so I figured that here was the best place to ask... Hypothetically, if I had redesigned Independent Company charters in a printable format, it it okay to post them here (in the files section)? a) Change to font and size of company Name and Number to aid in identification cross-table. b) Coloration of the picture, as an aesthetic touch, and also for the same reason as a). I considered finding new pictures online, but I liked the idea of coloring in the original art to preserve the theme, despite the difficulty of flood-filling a scanned-in image. c) A few changes to wording on special abilities, mostly to convey the same idea with fewer words (and thus either save space or increase font-size). 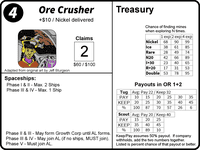 d) Added some player references - reminders of phase limitations on Growth Corps and AL, the explore odds from the back of one of the game manuals, plus Bill Parker's Expected Gains handout. Generally I don't think anyone ever has any issues posting things like what you described. It's Fair Use. You're not profiting from it. Oh, it's you. I should have guessed. You should email me those before I leave for Cleveland tomorrow! I have made and posted many such derivatives many times. On one occasional the publisher requested they be taken down. At no time has there been any ill will either before or after. You might note that there has been no pushback for my charters for 1867, map for 1869 and 18FR, or tilesets for other games, etc etc. You might note that my there has been no pushback for my charters for 1867, map for 1869 and 18FR, or tilesets for other games, etc etc. Thanks for the info. I knew that there were such things published on the geek, but wasn't sure if they were done with prior permission or what. I will post them and if the designer (who was also the publisher) asks me to take them down, I will. In Tom's case, I expect that he is more likely to say, "Thank you." I haven't commented before because I was waiting to see the actual files. Please add -- it can be in small type -- "Adapted from original art by Jeff Sturgeon" to these certificates. You could place it sideways by the left border of the upper section, so that it is not intrusive, but present. I have many artist friends. Some of them do not approve of their art being colorized and feel quite strongly about this. Making it clear that what you have done is not their artwork, but an adaption of their artwork, would be important to them. It's possible that Jeff himself wouldn't object -- he's a pretty easy-going guy -- but A) he is a professional artist; B) I am the copyright holder for this particular set of artwork; and C) I feel honor-bound to protect what usage is made of his artwork. Chris, is this condition acceptable to you? Absolutely, Tom, I will do that. Thanks for commenting. I was not 100% sure about whether it would be okay to colorize the art and post the files, but that's why I asked first. I felt like this route kept the original feel better than replacing the artwork with something different and probably less appropriate. If I have your permission to post them with that condition, then I will comply with that condition ASAP. Chris, as the copyright holder of the artwork in question, I don't see an issue with posting these files as long as there's a clear art adaption statement, such as "Adapted from Jeff Sturgeon's original art", on the certificates. Well, the original file was approved by GeekMod at 7am this morning (my time) and I uploaded the attribution fix at about 7:30am, so hopefully the new file will get approved as quickly as the first one. I already fixed the .png images in my gallery. For what it's worth (and obviously it's moot now the copyright holder has chimed in), that's not what defines fair use. Correct. However, non-profit is one of several considerations used by USA courts in evaluating the "Purpose and Character" of a proposed fair use. I'll also note that Fair Use is defined quite differently by various non-US countries. Most of that has nothing to do with the first round (i.e. OR1+2) income, and the parts that do have something to do with it (bonus for the Independent or for the bases they can reach in OR2) are already calculated in. The point of the expected gains numbers are to help plan out your first couple of turns. Whether or not the company will be able to buy a claim or a second ship in OR2, whether or not a player will make enough from payouts to buy an extra share of TSI, whether or not to add an extra $10 or $20 to your bid to allow the company to afford that claim or second ship, etc... It's also meant to give a new player some framework for how much the Independents are worth as far as bidding, since it's nearly impossible to have any clue to that on first or second play, but the long term value is tough to accurately gauge since so much of that depends on exploration and development.